This is not your typical kitchen because the homeowners are not your typical family. Start with mom and dad and seven kids. Then add a steady flow of foster children and being on call to provide county-licensed crisis nursery care. These gold-hearted parents needed reliable construction scheduling and super- sized design solutions to make the remodeling work. During this project all family meals were cooked via crock pot downstairs, so it was an upmost priority to accurately and swiftly schedule. Create extremely functional, high-capacity kitchen for a family with 7 young children, including consideration for safety of special needs and regular foster care/crisis nursery guests. Make the space look big, bright, and beautiful without sacrificing efficiency. Work with clients to develop innovative strategies to control costs without sacrificing features. Continuous center island, separate kids/adults silverware drawers, and strategically placed filtered water by peninsula sink keep young kids out of bustling work area between stove and main sink. Dual counter bars seat whole family, facilitate serving/cleanup keep mealtime peace. Commercial American Range stove with six burners, dedicated griddle, dual convection ovens and powerful hood for efficient, high-capacity meal prep. LVP flooring replaces carpeting throughout for easy clean up. Pantry/laundry/entry loop from kitchen provides ease of access for multitasking mom and groceries flow. Pass-through window with shelf for transferring food, drinks, and dishes to and from deck and grilling area without opening the door. Dimmable LED lighting, Energy Star appliances and increased natural light from open floor plan and French door wall conserve energy. Three-bin cabinet with pull out cutting board above for diligent recyclers. Dark wood wraps at peninsula integrate structural posts and long dropped beam with new cabinetry. Wood-look luxury vinyl plank flooring and neutral wall colors integrate spaces visually in the large, open floor plan. With kitchen’s interior walls removed and four-panel French doors window wall, natural light streams through interior and creates an expansive “together” space and broad supervision range for the large, young family. 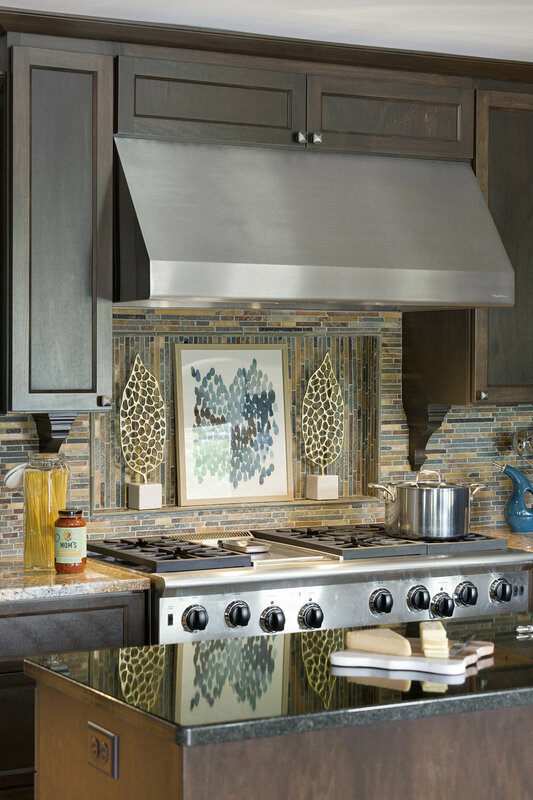 Attractive tile niche creates focal point at formidable six-burner American Range. Bold granite counters, tile backsplash, dark cabinets, lighter LVP flooring, stainless steel appliances, and under mount apron sink beautifully balance colors and textures and scale. Sliding window with counters on both sides enables mom to serve kids while they are on deck and to move food to and from the grill without opening French door screen. Design allows for great traffic flow for prep, cooking, cleanup, and family activities. Pull-out cutting board over recycling bins speeds cleanup during meal prep. Mudroom opens to kitchen but also offers pocket door access to laundry and pantry for efficient movement of groceries and dirty clothes. To achieve supersized design goals within moderate budget, the large French door unit was purchased from building products liquidator and the homeowner did demolition, installed flooring, and painted ceilings and walls. As wrapped, structural posts look purposeful and properly scaled and align perfectly with the counter and cabinet below. They also preserve enough seating for large family and maintain proper clearances for traffic, stools, and serving. Intricate granite counter measurements were re-verified three times to ensure trouble-free, precision installation. Windows at pass-thru window bar were carefully laid out so granite counter would align with lower tracks and the tops of the windows would be 80-in. AFF like the French doors. and transform your house to a home.